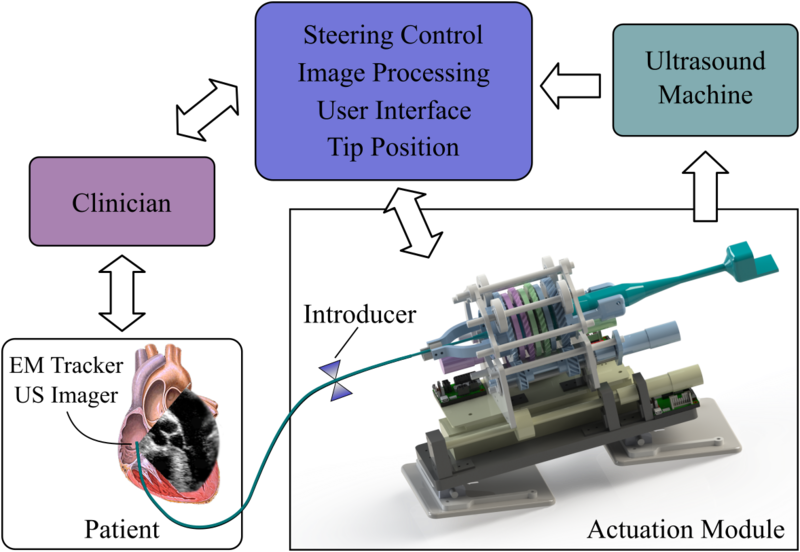 A robotic system for automatic ultrasound imaging during beating heart surgery can increase situational awareness, improve workflow, reduce procedure times, and reduce complications. This system steers an ultrasound imager in the tip of a steerable catheter to automatically image cardiac structures or working instruments (such as ablation catheters) inside the heart. Steering is controlled by using a closed-form solution for forward and inverse kinematics that calculates the direction of the side-facing ultrasound imaging plane. Our system is capable of accurate position control, angular adjustments, and instrument tracking. Commercially available ultrasound imaging catheters, known as intracardiac echocardiography (ICE), have an ultrasound transducer in the tip for acquiring high-resolution images from within the heart during procedures. This is useful for reliable imaging in diagnosis, navigation, and treatment. ICE catheters, which are currently controlled manually, are extremely challenging to aim due to the complex relationship between handle knobs and imager motion. The difficulty in steering ICE has limited its use to a few critical tasks. 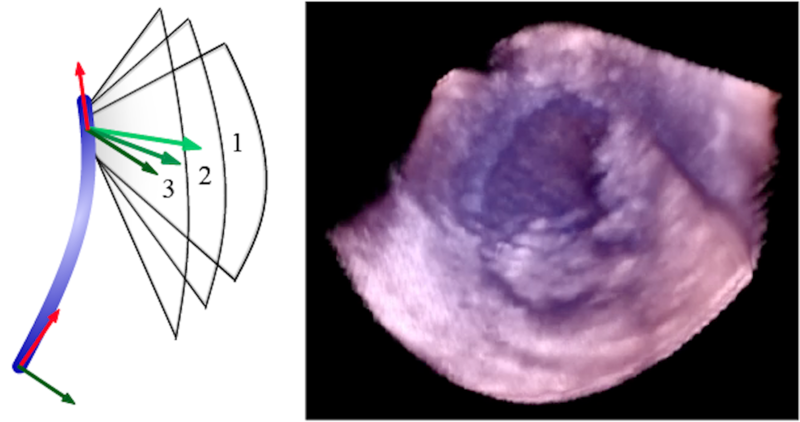 Our ICE-steering system can achieve specialized rotation motions to safely image regions of the heart. Sequences of 2D images can be reconstructed into a 3D or 4D volume, as in Figure 2. Additionally, the system can automatically monitor instruments that interact with cardiac tissue by localizing the instrument and rotating the ICE imager accordingly. This will show a high quality ultrasound image of the instrument-tissue contact point. The net benefits of the robotic system described here will include better situational awareness leading to faster work flow, reduced procedure time, and fewer complications. Proc. IEEE International Conference on Robotics and Automation (ICRA), Singapore, May 29 - June 2, 2017. Finalist of the Best Poster Paper Award. IEEE Transactions on Robotics, Volume 33, Issue 1, pp.81-91, Feb 2017. Proceedings of the 9th Hamlyn Symposium on Medical Robotics, London, UK, June 25-28, 2016. Proc. IEEE International Conference on Robotics and Automation (ICRA), Stockholm, Sweden, May 16-21, 2016. ASME Journal of Mechanisms and Robotics, 8(5), May 2016. Workshop on Navigation and Actuation of Flexible Instruments in Medical Applications (NAFIMA), IEEE/RSJ Int. Conf. on Intelligent Robots and Systems, Hamburg, Germany, September 28 - October 02, 2015. Proceedings of the ASME 2015 International Design Engineering Technical Conferences & Computers and Information in Engineering Conference IDETC/CIE 2015, August 2-5, 2015, Boston, MA, USA. MICCAI 2014 Workshop on Augmented Environments for Computer Assisted Interventions, Boston, USA, September 14, 2014. MICCAI 2014 Workshop on Computer-Assisted and Robotic Endoscopy, Boston, USA, September 18, 2014. Proceedings of the 6th Hamlyn Symposium on Medical Robotics, London, UK, June 22-25, 2013. Proc. IEEE International Conference on Robotics and Automation (ICRA), Karlsruhe, Germany, pp. 5774-5779, 2013.